The past two weeks have been a bonanza of cloud conferences and they provide useful insight into the ongoing IaaS cloud wars between Amazon Web Services, Microsoft Azure and Google Cloud Platform. Last week Google attempted to attract developers to its cloud with the inaugural GCP NEXT Conference in San Francisco. Google trotted out all its top executives, including newly minted cloud chief Diane Greene and parent company Alphabet’s Executive Chairman Eric Schmidt. Executives talked about cutting-edge new technology available from Google’s cloud, like voice-recognition machine learning APIs and a new cloud management tool named StackDriver. The company announced a big expansion of its cloud from four to 16 regions by the end of next year all around the world. Google was clearly making its case that it’s an enterprise cloud company. This week it was Microsoft’s turn. Build is Microsoft’s big developer conference and day 1 featured lofty new products like Hololens and company CEO Satya Nadella explaining how a world of smart bots would be prevalent in a few short years. Day 2 at Build was all about the cloud, and it reinforced why Microsoft is one of the leaders of the IaaS market. Microsoft Executive Vice President Scott Guthrie said its cloud is signing up 120,00 new users every month. It has 30 regions, and manages more than 1 million servers. Eighty-five percent of Fortune 500 companies use Microsoft’s cloud, Guthrie said. Guthrie announced new features in Azure’s Internet of Things (IoT) platform, and BMW’s Vice President Thom Brennan spoke about how the company is using Azure to power a connected driving experience for customers. AccuWeather, Schneider Electric and Starbucks all spoke about how they’re using Azure and Office 365. Microsoft updated its NoSQL database named DocumentDB – a core database offering for cloud-native applications. Guthrie announced new features for Azure’s mobile application development platform named Xamarin, which Microsoft just bought, and announced Guthrie announced Microsoft would open source many of Xamarin’s components. Microsoft’s Day 2 keynotes seemed much more grounded to what enterprises are using the cloud for now, and what they’ll likely use the cloud for in the near future. Google’s announcements seemed to focus on the company’s engineering prowess, but it’s unclear how much of that technology will be used in the enterprise. How many customers went home after GCP NEXT and built an app using the company’s new voice-recognition machine learning API? 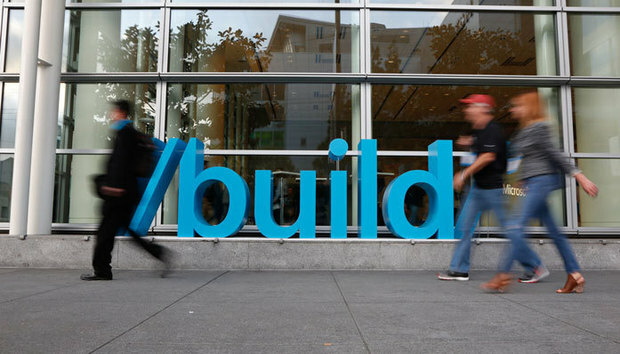 Microsoft’s news of making Xamarin free for Visual Studio customers was met with thunderous applause across the Moscone Center. This shouldn’t be a surprise. Microsoft has been selling to the enterprise for a long time – they know what resonates with this market: Scale, usability and customer references. Google still seems to be figuring out how to sell to big businesses. Despite some customers, like DropBox, migrating away from AWS in favor of Google, it seems like Google still needs more time to establish its enterprise hold in the IaaS market. Microsoft, meanwhile, continues to put the pressure on AWS. It’s got some uniquely differentiated features. It’s Office 365 SaaS platform is a huge benefit to the company and provides an enormous sales pipeline for selling Azure IaaS to its existing customers. It’s on premises infrastructure named Azure Stack that integrates with the public cloud is unmatched by Amazon or Google. And it’s not just between these three vendors but other companies are looking to stake their claim in this market too, most notably IBM. But AWS still looms large over this market. Almost everything that Microsoft and Google spoke about at their conferences AWS also has a product line in. Machine Learning? Check. IoT? Yes. NoSQL databases? Sure thing. Amazon may not be the leader in each of these categories but it shows how tight the race is among these vendors. The consensus is that neither Microsoft nor Google did anything over the past two weeks to unseat AWS, but it’s clear the cloud wars are as hot as ever.